One glorious week with a C7. 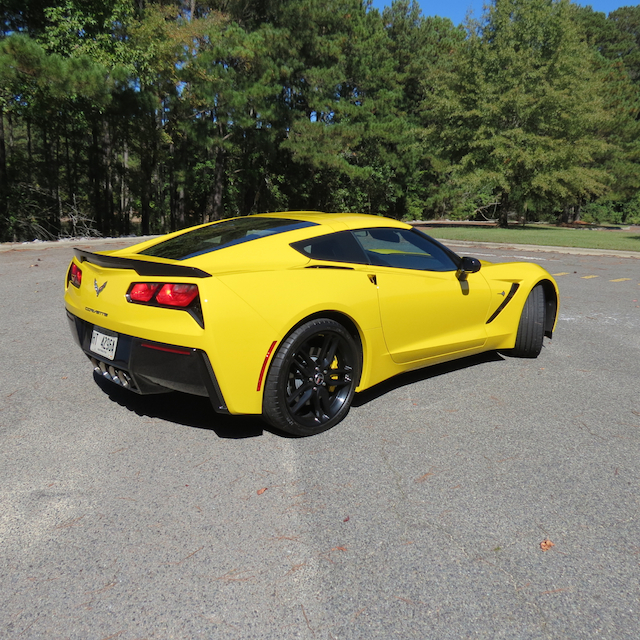 Beyond compare: this “velocity yellow” paint scheme is super bright. The current rendition of the classic Corvette is instantly recognized for what it is: a halo sports car for Chevrolet. This model also transcends the brand, putting forth its distinctive Corvette face and familiar muscular, low-to-the-ground stance. The most significant changes start from the front wheels on back with larger and additional vents, a tempered B-pillar and the inclusion of rear-quarter windows. The hood and the roof are formed by carbon fiber, every body crease is more extraordinary than before and the front fascia takes on an even more pronounced, menacing look. The fresh look has been carefully translated to the rear with its own distinctive and aggressive tail lamp arrangement. The quad-centered exhaust pipes mean business, putting forth a symphony of cat-back bings, belches and booms that will both astonish and delight you. There are many other touches the designers carefully considered when crafting this masterpiece. One example: the boomerang-shaped daytime running lights punctuate the front fascia, serving as twin exclamation points and, perhaps, a warning to all who see this sports car approaching in their rear view mirror. An important side note: I have never been so followed, chased or otherwise stared down as I was in the Corvette Stingray. From the first day I had it to its departure, it seemed as if every sports car owner and pretender pulled up behind me, sat in my blind spot or beckoned me to a race. Passengers whipped out their smart phones, taking pictures and making calls, and one police officer suddenly appeared in my rear view mirror as I entered the highway, pulled along side me, but thankfully kept his blue lights off. The Corvette was the celebrity and I was simply the willing servant, performing my role dutifully and without complaint. 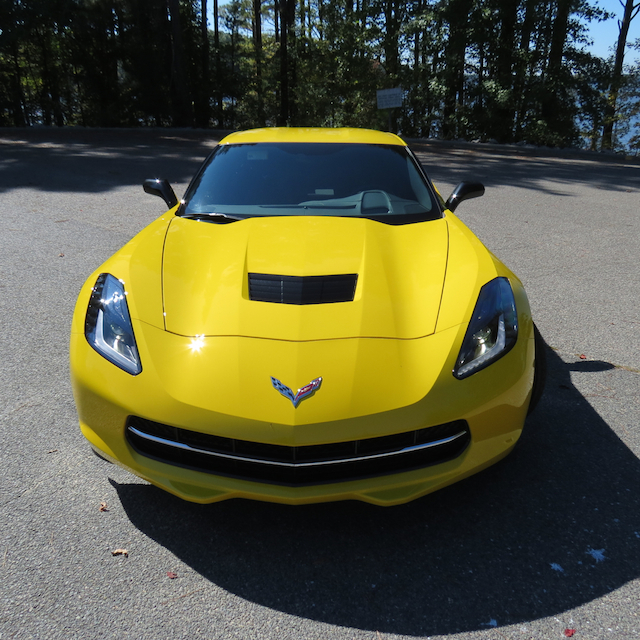 There is no one-size-fits-all Corvette Stingray. Never has been and probably never will be. My weekly driver retailed from $53,000 (the price has since increased to $54,000 or $54,995 with destination charge) and listed for $67,445. That’s more than $13,000 in options, hardly unusual for any Corvette. 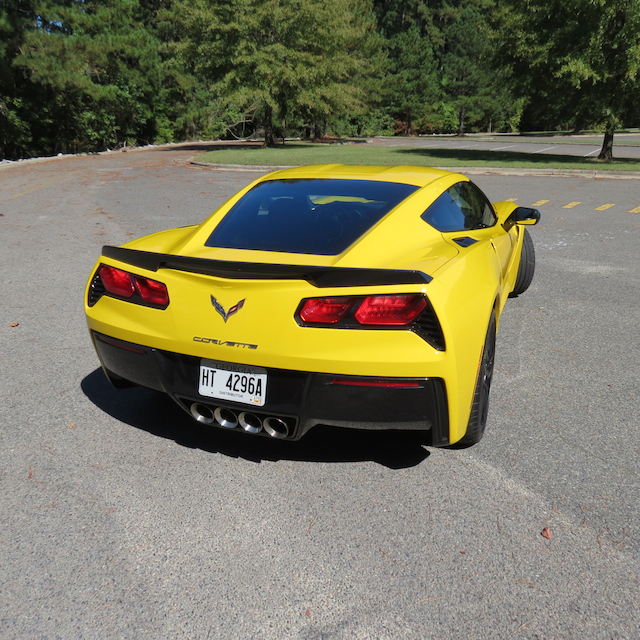 Indeed, it is doubtful that there is a base Corvette sitting on any dealer lot. 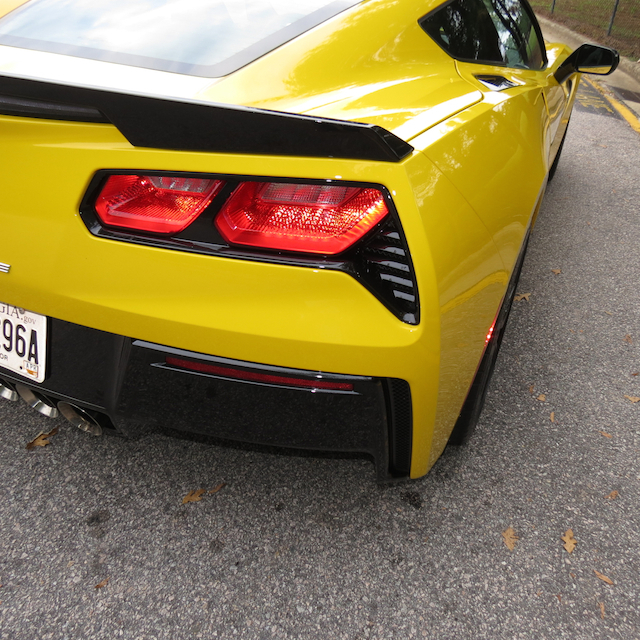 During my week with the sports car, I talked fairly extensively with two new C7 owners who explained the process of ordering a model to their exact requirements. Definitely, you can take one home from the showroom floor — if available — more than likely you’ll want to outfit yours as you see fit. Pull up the build and price configurator at Chevrolet.com and you’ll find both coupe and convertible body styles. The convertible is priced at $59,995, exactly $5,000 more than the coupe. Standard 1LT models may be upgraded to a Z51 performance package, adding $5,000 to the base price. Chevrolet prices the 2LT from $59,155 and the 3LT from $64,445. As delivered, my weekly driver came with the following: a ZF1 appearance package ($1,995), a performance data and video recorder, including navigation ($1,795), an all-new for 2015 8-speed automatic transmission with paddle shifters ($1,725), a multi-mode performance exhaust ($1,195), velocity yellow tint coat ($995) with matching yellow brake calipers ($595), black painted aluminum wheels (19 inches up front, 20 inches to the rear) for $495, sueded microfiber seat inserts ($395) and a carbon flash painted spoiler and side mirrors ($100). The ZF1 appearance package brings in larger 5-split spoke silver-painted aluminum wheels, performance summer-only tires and a body-colored rear spoiler. 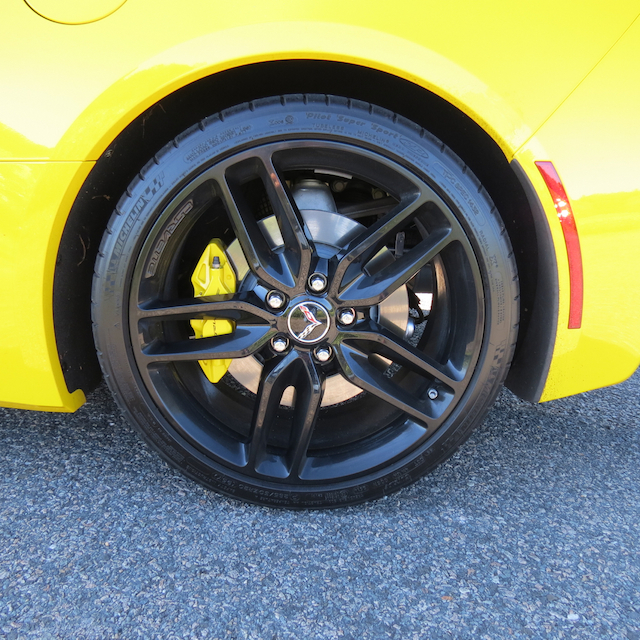 In other words, the standard 18-inch wheels up front and 19-inch wheels to the rear get bumped up. Every 2015 Corvette Stingray is powered by a 6.2-liter, 16-valve V-8 engine making 455 horsepower and 460 foot-pounds of torque. This naturally-aspirated engine is paired with a 7-speed TREMEC manual transmission or an 8-speed automatic transmission with paddle shifters and an available limited-slip rear differential. The new for 2015 automatic can move into manual mode for quick shifting on the track. Last year’s model offered a six-speed automatic. The manual provides rev-matching on both up- and down-shifts. 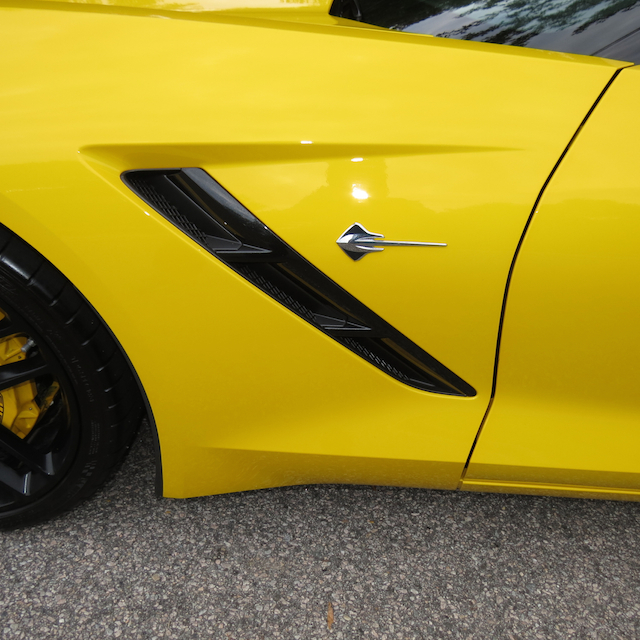 Choose the Z51 performance package and your Corvette receives closer gear ratios for the manual, the electronically-controlled limited-slip differential, additional cooling features for the gearbox, brakes and the differential, larger brakes and Michelin run-flat summer tires. EPA ratings come in at 16 mpg in the city (17 mpg for the manual) and 29 mpg on the highway for a combined 20 mpg. I averaged 20.3 mpg, driving for 469 miles and mostly open road driving at that. 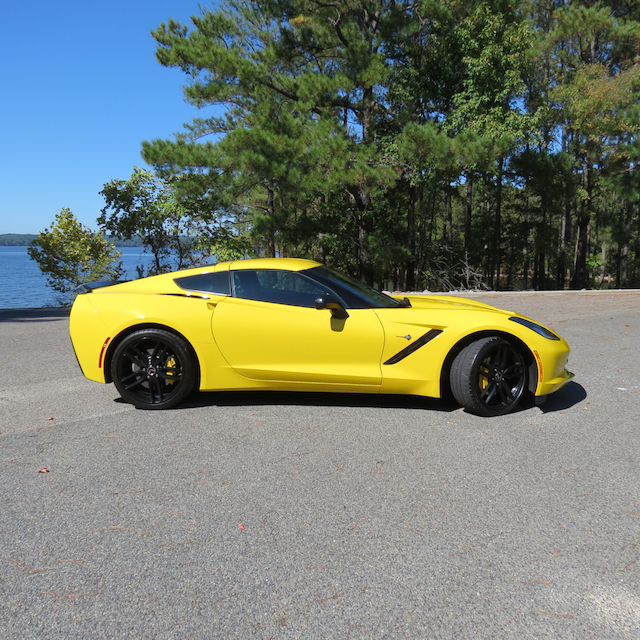 Credit a few things with helping this Corvette Stingray achieve its decent fuel economy numbers: cylinder deactivation, performance tires, a low coefficient of drag and a 3,298-pound curb weight. The voluptuous Corvette body comes with a beautiful interior too. The bucket seats are formed to hold you in place, providing the necessary support as your head snaps back when you’re blasting down the road. The leather seats are heated and cooled, providing lumbar support and ample movement despite a small area. The seats back up to the hatchback and it is at this point the roofline tapers. 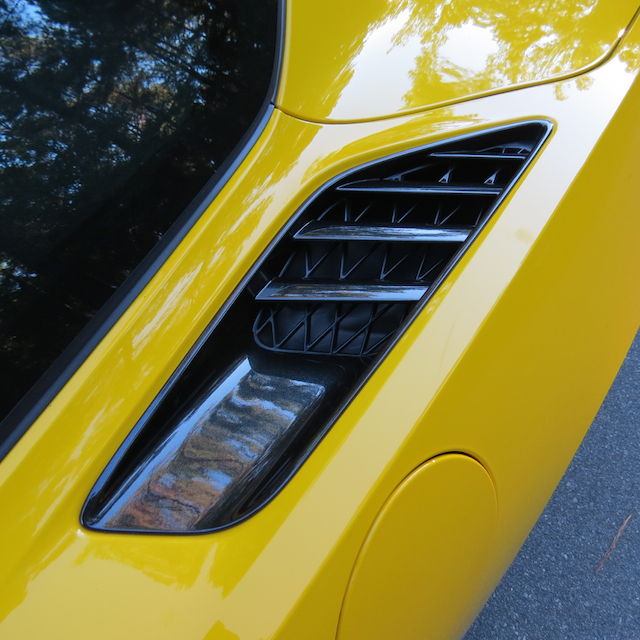 The Corvette Stingray features a digitalized instrument panel with the tachometer centered prominently. To the left is a 205 mph speedometer; to the right are fuel and oil temperature gauges. As you would expect, a digital driver’s information center is found within the tachometer, what serves up such useful information as: engine hours, lifetime revs, fuel usage, fuel economy, trip information, average speed and then some. I like the Corvette’s head up display for two reasons. First, because it is there and is a feature I enjoy on any car. Second, it can easily be moved to float above the hood at various heights. It includes your current speed, a tachometer and a G-meter for track mode. You’re piloting this jet and the HUD is your guide star. A leather-wrapped electronic tilt and telescopic steering wheel comes with sport stitching and an extra thick grip. The center console is easily customizable and is also retractable. When deployed you have a hidden storage area large enough for your wallet or other valuables. It also has one of three USB ports; the other two are located in the center storage compartment. Buttons and knobs operate the audio system, itself controlled by voice command, if desired. 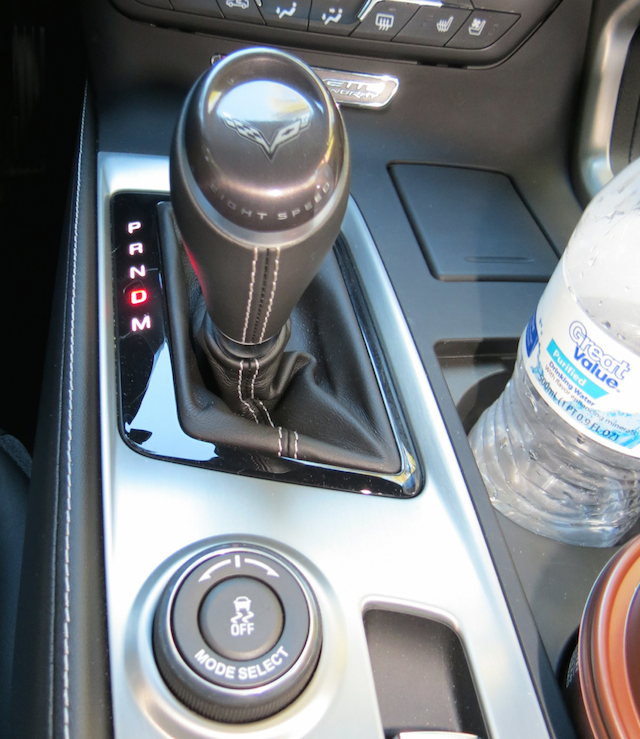 One area where I would like Corvette’s designers to make a change is in the area immediately to the right of the stick shifter. Instead of simply offering a concealed cigarette lighter, a place to hold a smartphone upright would be ideal. Bonus to the designers if they can still find a way to keep the lighter and provide a smartphone dock. The other suggested change would involve the cup holders. As currently designed, if you place a pair of bottles in the holders, they will not stay in place if you step on the gas. I’ve seen much less expensive cars provide “grippable” cup holders. That same grip could be applied to the smart phone dock. There is just no way to appropriately describe the Corvette’s attributes. Its reputation precedes it and its swagger is legendary and well known. The Corvette is a dream car — a screamer for the back road or on the track. Or wherever else you can light her up without a blue light special in your rear view mirror. What the Corvette does do is make you glad that you’re alive. Not simply alive either, but breathing in everything that this sensual four-wheeled monument to automotive craftsmanship puts out. It has a unique smell, likely a combination of its leather and carbon fiber. It also has a unique feel, what you control with a mode select dial located just aft of the stick shifter. You can choose E (economy), W (weather), T (touring), S (sport) or TR for track. I had it in sport mode 98 percent of the time, but turned off the accompanying stability control only once. Push the start/stop ignition button and the Corvette Stingray lets out the first of many rumbles. The cat-back system immediately percolates and hums until you step on the gas. It is at varying speeds and actions when the exhaust note sings, ranging from a multi-octave moan to a symphonious outburst. Your right foot controls the four-pipe organ, venting it to varying degrees as you see fit. 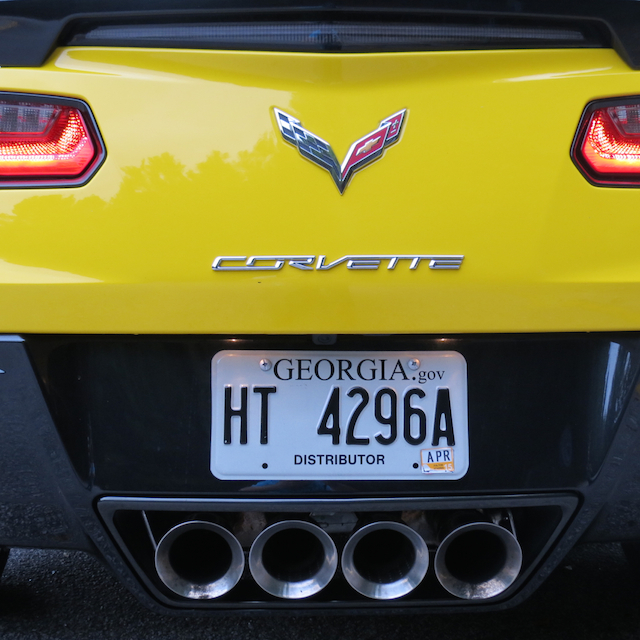 The Corvette’s 50-50 weight ratio, low stance and wide track keeps this sports car hugging the road. On the straightaway you’ll hit 60 mph inside of four seconds with the automatic, slightly longer with the manual. 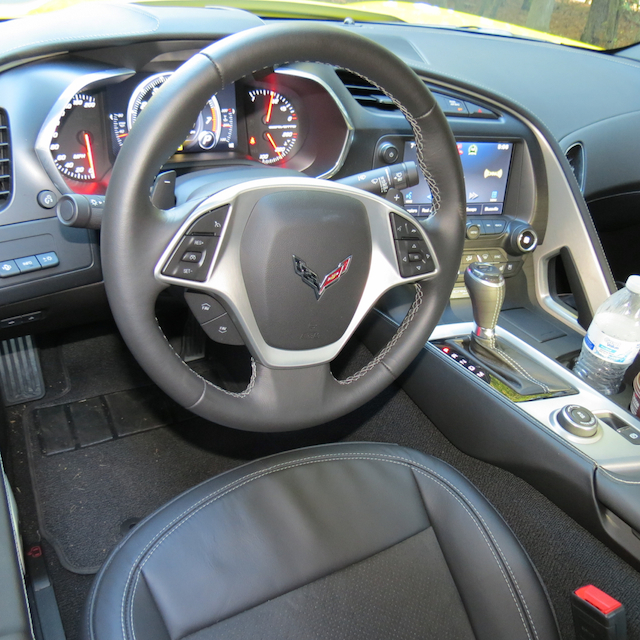 Its electronic power steering, a bane for some driving purists, isn’t all that bad — the Corvette’s engineers worked diligently to increase system stiffness by moving the steering gear to the cradle and reinforcing the steering column. Take it on any twisty road with its share of rises and falls and you’ll enjoy the full benefit of involved driving. As much as the Corvette Stingray is a hoot to drive, there is a segment of the fanboy/fangirl populace that demands more. As in a certain exclusiveness found only in a top-end, ultra-high performing model. 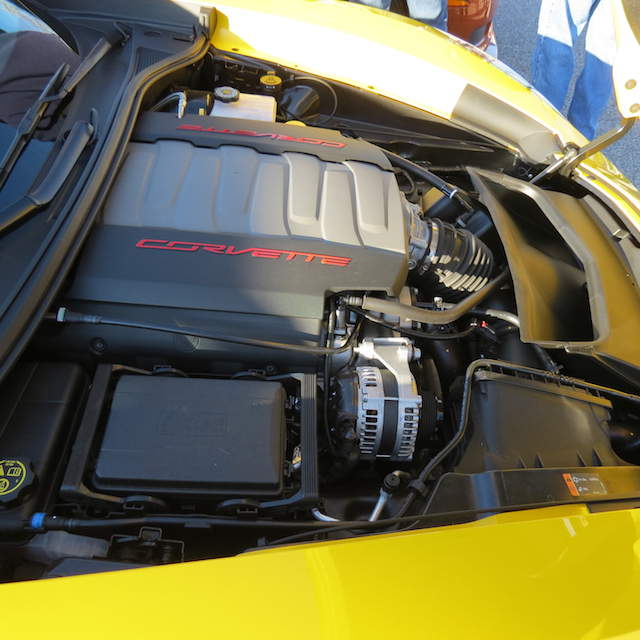 And that edition is the Corvette Z06, a model with a 1.7-liter Eaton R1740 TVS supercharger, providing 200,000 rpm of spin or 5,000 rpm more than the supercharger gracing the ZR1’s LS9 engine. 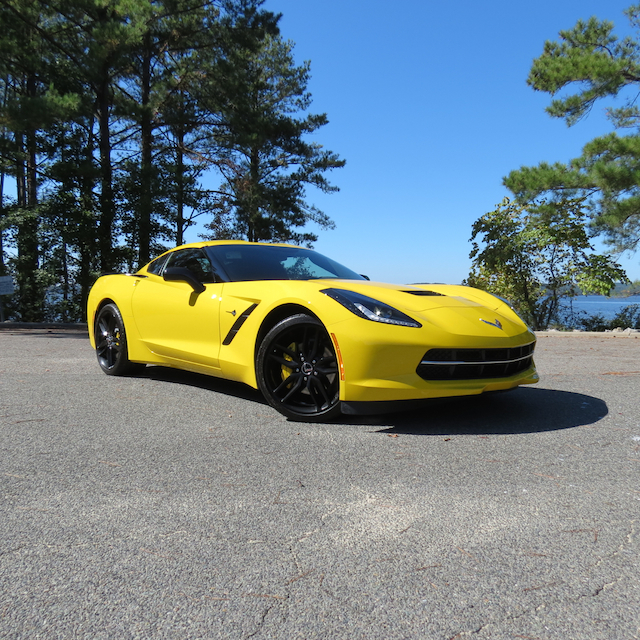 The top-of-the-range Corvette is rated 650 horsepower and 650 foot-pounds of torque. Just imagine that! Chevrolet says that the full-blown Z06 will come outfitted with larger and wider Michelin tires, massive Brembo brakes and enhanced rotors. Other goodies will set this model apart from the standard edition, what will go on sale in early 2015. 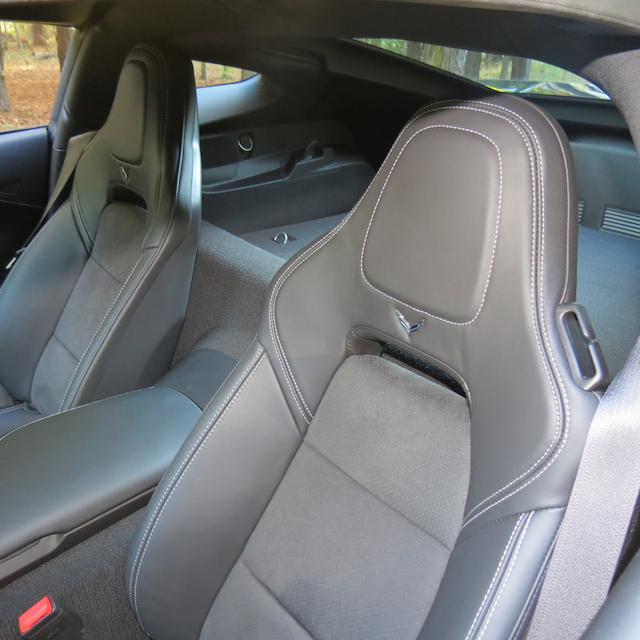 In the 2015 Corvette Stingray I gained a much greater appreciation for both the history and capabilities of this masterful sports car. I also discovered that the fan base for the Corvette is enormous with dreamers and aspirants joining owners in shared admiration for what is arguably GM’s best model. 2015 Chevrolet Corvette Stingray photos copyright Auto Trends Magazine. All rights reserved.